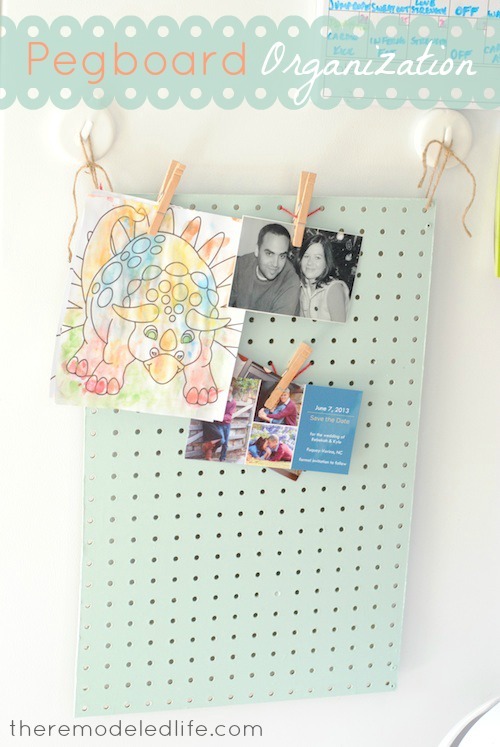 I love a pegboard. They are so versatile and great for organizing. I wanted a way to pretty up the fridge clutter - you know the stuff that accumulates all over the outside of your fridge? As well as a way to keep it organized and neat - so a pegboard was the answer. This was super easy and quick. I actually had a leftover pegboard already but this stuff is not expensive if you want to go buy some. I gave it a quick two coats of paint. This is a paint sample that I grabbed for a dollar a while back when Lowes was trying to get rid of all of their pre-made samples. From time to time I browse the oops paint section and pick up super cheap paint for little projects like this. I love this soft color, its called Glass Tile by Valspar. Next I just needed to tie in a few pieces of yarn and add a few clothespins. I love that this is quickly customizable. I can add more yarn or change the placement easily. 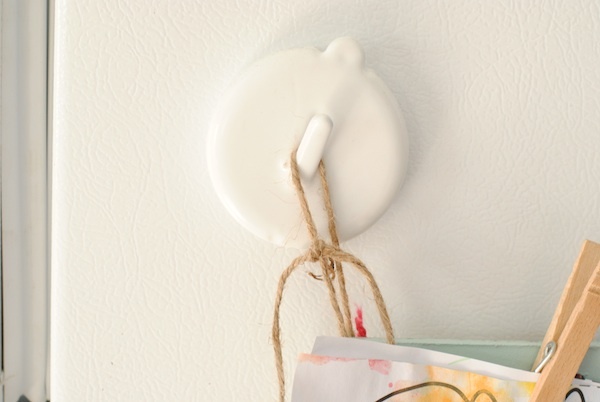 I used these magnet hooks and some twine to secure it to fridge. I have almost thrown these away a few times - so glad I held onto them. Now we have a pretty way to corral all of the fridge clutter. Thanks so much for joining me today! Anyone else love a good pegboard? 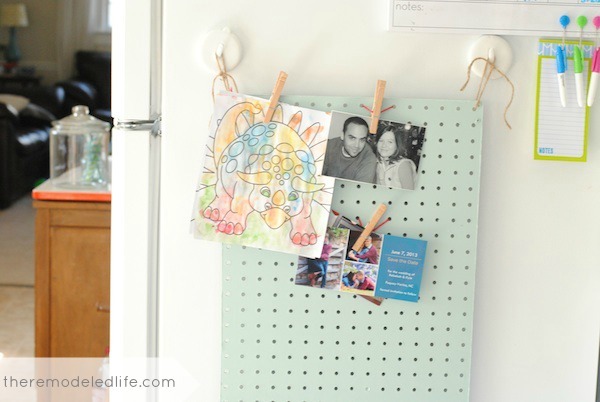 Have a great pegboard organizing tip to share? Have a great day! Very nice! I love the color of the pegboard. Super cute!! This is a great idea! I found you today thru the Live Laugh Rowe Linky. I hope you get a chance to stop by my blog and leave a comment, too! All I want to know is did Silas color that dinosaur himself? Wow he has skills. 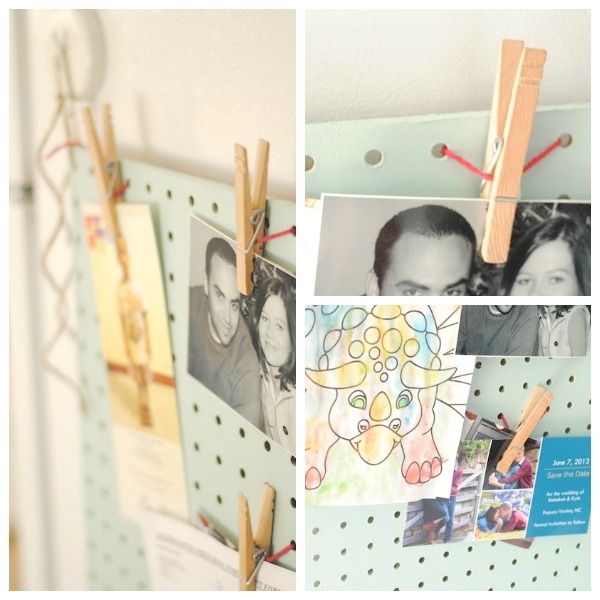 I like the pegboard, very good idea. I never would have thought to put a peg board on the fridge! <3 it! Smarty! What a great idea! I can't believe those magnet hooks are holding that up, they must be super strong. Pretty color!